We tried this recipe for freezer meal night and I'm in love! My kids even gobbled it up which was magical too. I think a lot of people hear curry and they think spicy but curry is one of those recipes you can easily tweak to make it perfect for your preference. 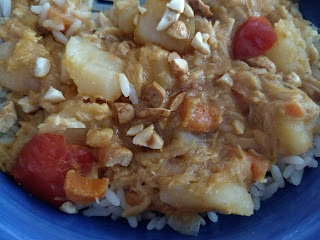 My husband and I just added red chili flakes to spice our up and let the kids enjoy a non-spicy meal :) This is a nice hearty meal with potatoes and chicken and a yummy nutty curry sauce. Enjoy! Cook chicken. Chop and set aside. In a large stock pot heat coconut oil and add diced vegetables. Cook over medium heat, stirring often to coat veggies in oil, for about 15 minutes or until veggies begin to soften. 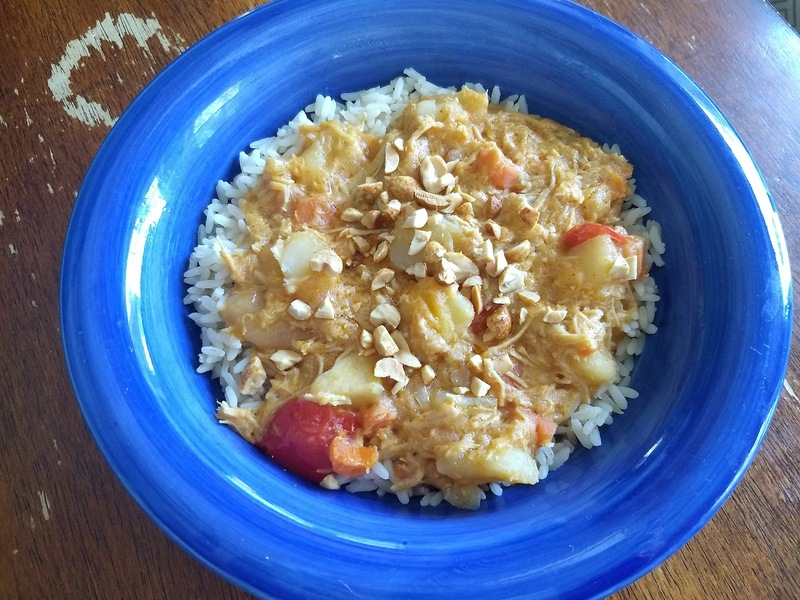 In a medium bowl, combine coconut milk, pastes, lemon juice, fish sauce, brown sugar, chicken bouillon, and peanut butter. Pour sauce over veggies. Add water and chicken. Add chili flakes if desired. Simmer over low heat for 30 minutes or until veggies are tender. Server over rice and top with chopped peanuts and extra red chili flakes if desired. Heat coconut oil and add to bottom of a large crock pot. Add chicken and vegetables and stir to coat. Combine coconut milk, pastes, lemon juice, fish sauce, brown sugar, bouillon, peanut butter, water and chili flakes. Pour over chicken and veggies. Cook in crockpot on low for 5-6 hours or until chicken is cooked through (use thermometer for best indication) and vegetables are tender. The sauce will reduce and thicken some while cooking. Serve over jasmine or botan rice and top with chopped peanuts and extra chili flakes if desired. Dice and chope chicken, onions, bell pepper, carrots and potatoes. Place in a gallon sized freezer bag. In a medium bowl combine all remaining ingredients (except water, peanuts, and rice) and whisk until well combined. Pour sauce over chicken and veggies in bag. Label and freeze. When ready to serve: Add contents of bag to large crockpot with 1-2 cups water. Cook on low 7-8 hours or until chicken is cooked through (use thermometer for best indication) and vegetables are tender. The sauce will reduce and thicken some while cooking. Serve over jasmine or Botan rice and top with chopped peanuts and extra red chili flakes if desired. Many of you know that I'm obsessed with Panera Bread's Autumn squash soup! So yummy!! I've tried several recipes over the years and this is as close as I can get. I've taken my favorite parts of several different recipes and mixed them together. I think it comes pretty close! I've also adapted it for my freezer meal workshop too so make it and store it away for a busy night. Give it a try! Peel, core and chop butternut squash and place in a large stock pot. Chop onion, carrots, and apple and add them to the pot as well. Add all remaining ingredients except for the heavy cream and bring to a boil. Reduce heat to medium low and simmer for 20-30 minutes or until veggies are tender. 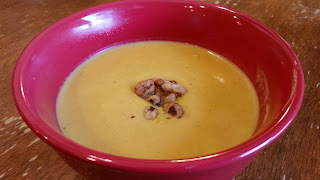 Using an immersion blender- blend ingredients until smooth. If you don’t have an immersion blender you can mash up ingredients as best you can with a potato masher and carefully place them in a regular blender until smooth. Stir in heavy cream. 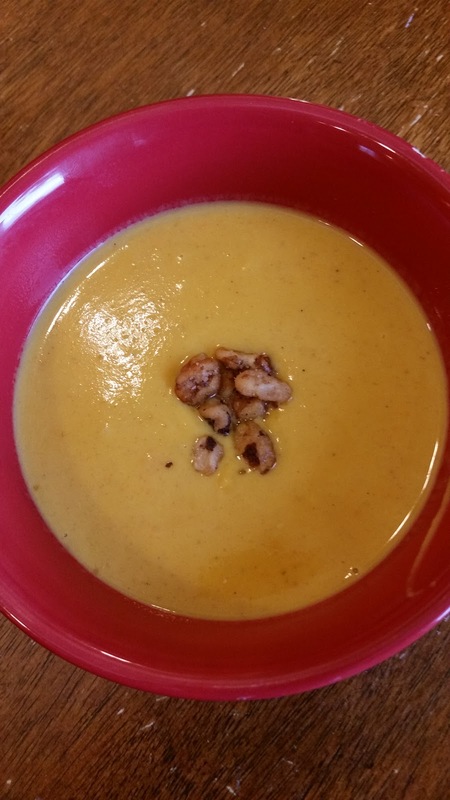 Top with toasted pumpkin seeds or candied pecans if desired. Peel, core and chop butternut squash and place in a gallon sized freezer bag. Chop onion, carrots, and apple and add them to the bag. Add all other ingredients to the bag and seal. Double bag and label. When ready to serve, combine contents of bag with 3 cups of water in a large crock pot and cook on low for 8-9 hours or until veggies are all tender.